Few designers know the power of symbols better than Susan Kare, whose work is engraved in the mind of any Mac user. She tells us the fascinating story behind her design of Apple’s ‘command’ key. One of my favourite symbols is the Swedish road sign for a landmark. 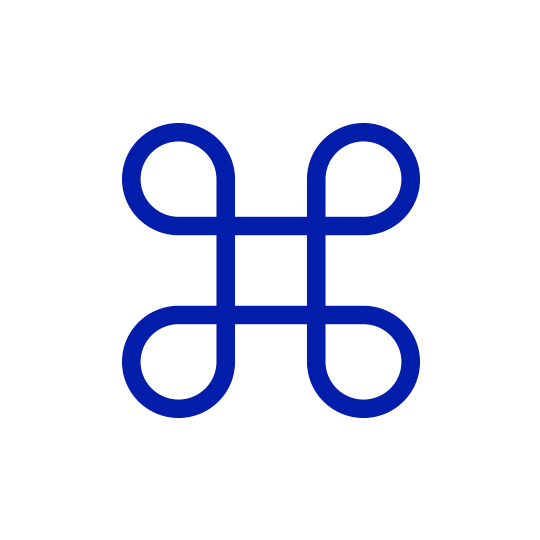 Apple appropriated this symbol in 1984 for a Macintosh computer key cap, and in pull-down menus, to indicate a "command" or "feature" keyboard shortcut. It was part of my job to find a symbol for this key cap to replace its predecessor, the Apple logo. (Steve Jobs thought we were using the logo excessively in the software). When I first came across the Swedish graphic by looking up "feature" in a symbol dictionary, I thought it was an attractive image that suggested a cloverleaf or highway, and it seemed a more pleasant choice than some other possible visuals that came to mind to represent "command" such as a police hat, badge, whistle, or stone tablets. It was a bit of a struggle to come up with something appropriate to represent the concept — concrete nouns (such as a document or painting application) are typically easier. But the software group embraced the road sign icon, it was remarkably easy to emulate in 16 x 16 pixels, and it has remained on the keyboard for almost 30 years. But the reason it's a favourite is based on a note I received several years ago (obviously a while after the icon made its digital debut). As an icon designer, I generally believe that good icons are meaningful, because they're more memorable. I spend a lot of time thinking about metaphors that help make a connection between an idea and an image. The command key image made sense because it stood for an interesting feature, but I thought the visual was totally abstract, until I was enlightened about its meaning in an email from Sweden, in which the writer told me that the mark was actually a stylised view of a castle seen from above, with four turrets. A little Internet research later, and I could easily "see" the icon in a photo I found of the ruins of a fortress in Borgholm, on the Island of Oland, Sweden, that was built originally in the second half of the 12th century. It made the image richer to me, and more fun, because now I'm reminded of something relevant to the concept whenever I see it. The first command key appeared on the Apple III in 1980. Its primary purpose is a modifier, allowing users to enter keyboard shortcut commands either through double or triple press combinations. Cmd + S for save; Cmd + C for copy; Cmd + Control + Power for forced restart. The original modifier key was, in truth, the control key: the original teletype systems that superseded telegraph used the control key plus another key stroke to exact any mechanical changes to the machine not related to typing. Kare’s work for Apple, which she joined in 1982 charged with creating user interface graphics and fonts, continues to hold a powerful influence over software and web design. Her concise, often witty icons, buttons and tool cursors have seeded into the general psyche to such an extent that they appear omnipresent. The lasso, the paint bucket, the enigmatic dogcow, the spray paint can, the trash can and the endearing ‘Happy Mac’ are all Kare inventions, though you will now see variations of them across a wide range of products.